Grab a $1 Membership & Receive $147 Worth of Bonuses! 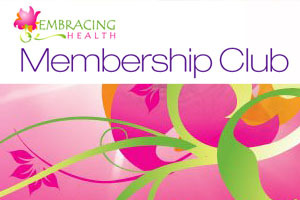 You may have heard me talk many times about my Embracing Health Membership Club, and I have been working hard to expand the quality content & valuable health information it contains. I believe it has developed into one of the best educational packages on food, fatigue, hormones and health that you will find! Each month, themed modules on a particular health topic delve deeply into the subject via an 8-10 page Membership Magazine, as well as through audio interviews with esteemed experts, lectures, videos, presentations and fantastic bonus content. Recently I interviewed health campaigner Eve Hillary, and found it to be one of the most important interviews I have done, taking us through the issues of health freedom in Australia and protecting our rights to choose the type of health care we require. Because this information is so important, I wanted to get this valuable interview to as many people as possible, so I am making it available to everyone who signs up for the $1 trial membership before the 1st of November, 2011. Yes Please! I want $147 worth of bonuses for just $1! As well as this advance screening of the Eve Hillary interview, I have some other exciting bonuses to offer new members! 1) Access to a 1 hour exclusive webinar with me on the evening of the 2nd November, 2011 – our topic will be: “Making the Most Out of Every Mouthful” and not only will you be listening to some great information, you will have the ability to ask questions and have them answered on the spot! 2) The DVD “Fifteen Years Raw – Victoria Boutenko” is available online to new members for a limited time. This is an amazing film of Victoria Boutenko lecturing about her journey as a 15-year-100%-raw-foodist. Even though we may all not aspire to emulate this feat, Victoria shares an enormous amount of vital information about food and health, and shares her story and research. 3) A 10% discount voucher to the Conscious Choice store! Your first choice for buying quality superfoods and raw supplements, kitchen equipment and food preparation classes. This $1 membership offer is only available for a limited time-frame, so make sure that you sign up today for just $1 to receive all this great information and generous bonuses! Offer ends 1st November! Please note that you are under no obligation to remain with the membership and can unsubscribe at any time, however I hope that you find the content of such value that you continue to be a part of the Membership Club! Great insight into the issues that face people looking to move people into a more natural lifestyle.